Having stayed on Koh Tao longer than we expected, we quickly came upon the end of our first month abroad. With the close of the first month came the end of out 30-day tourist visa. The Thais are tourism geniuses and created an entire industry to pry a few more dollars from travelers pockets. Upon arrival in Thailand, they give you a stamp allowing you to stay for 30 days. When your 30 days come close to inevitably running out, have no fear – travel agents are here. – 19:00. Take a taxi (back of a pickup truck) from our cosy end of the island to bustling Mae Haad, the economic center of the island. – 20:30. After wandering around the town (a place we traveled through frequently on our way to/from the dive boats) we post up at a nice little restaurant on the beach. – 22:00. After finishing a beer, we head to 7/11 to grab provisionals (chips & M&Ms) for the journey. – 22:30. Check in with the ferry operator. Feel an extra sense of gratitude for our travel agent as a couple in line near us have tickets for the wrong ferry and are instructed to try again in the morning. Yikes. – 23:00. Find our bunks on board the overnight ferry. It’s a retrofitted WWII landing craft that now transports cars/building materials/goods etc from the mainland to the island. – 04:30. Arrive in the transport hub Chumphon. Groggy from a few hours of sleep, we await a minibus. – 05:15. After a couple of mini-busses come and go, another pulls up and tells us to get in. Why not? We hop in with 10 other brave, sleepy souls. Armed with the knowledge that the minibus trip is the scariest part of any of our travels, confidence is not inspired upon seeing the driver and business operator kick the front-driver side tire, shrug, and press on. – 05:17. Driver is driving with his head out the window to stare at his tire. He is obviously somewhat concerned, but we press on. – 05:45. Driver is driving with his head out the window because that is much easier than using the defrost and windshield wipers. – 05:46. Erin decides its best sleep through the terror. – 05:47. Lee wishes he could sleep through this Cole Trickle inspired driving performance. This guy has a schedule to keep and he’s gonna keep it. – 09:15. Checkered flag. We reach our destination of Ranong, Thailand. We go through immigration and check out of Thailand. See you again soon. – 09:30. Load onto a long tail boat with our 10 new friends (and 1 random catcher-on) and take a slow boat ride to Burma. – 10:30. 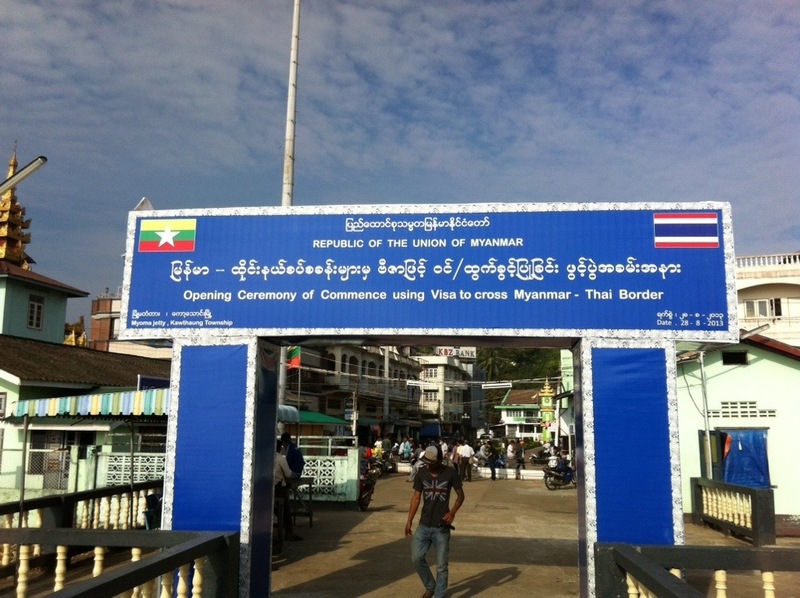 Arrive in the Republic of the Union of Myanmar. Proceed directly to immigration. – 10:45. Collect passports with shiny-new Myanmar stamps. Entrance and exit. – 10:47. Re-board the long tail. 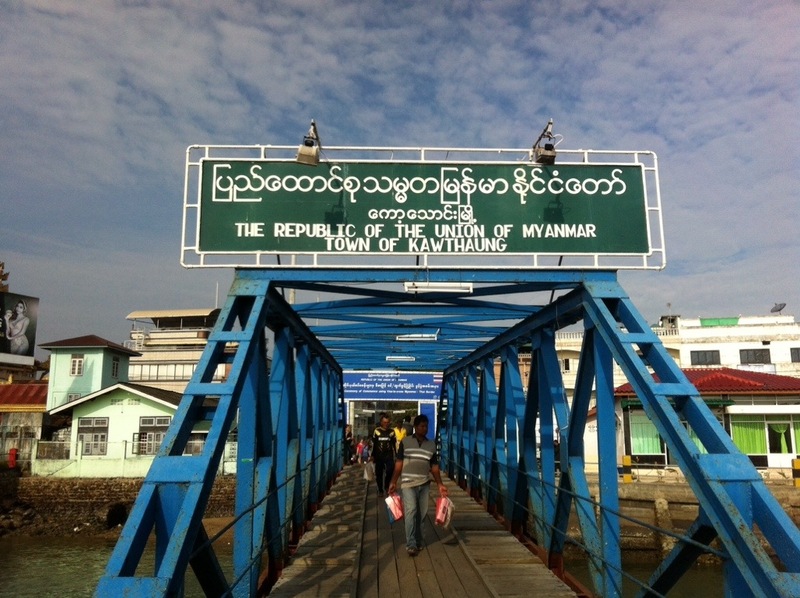 Burma was lovely. – 11:45. Finally, back to Thailand. Get a new stamp (or 4th of the day) and another 30 day hall pass in Thailand. – 12:00. Board the Days of Thunder bus and head back toward Chumphon. – 14:30. Arrive in Chumphon, with all 4 wheels. Immediately locate some Pad Thai because, hey, we’re in Thailand. – 16:00. High-five for not being in the galley with the sickies. – 17:00. Arrive in Mae Haad hoping our dive shop taxis may still be around for a free ride. Alas, we decide to walk back to our end of the island. – 17:35. It takes an hour to walk that far? No problem, be there in 35 minutes.